MainAll NewsInside IsraelPope Set to Ignore Bethlehem's Christian Tragedy? Pope Set to Ignore Bethlehem's Christian Tragedy? As the papal visit to Bethlehehem nears, the talk is about Jewish graffiti, not the expulsion of Bethlehem's Christians. Pope Francis will begin his visit to the Holy Land next week with a trip to Bethlehem, but he is unlikely to raise the subject of the exodus of Christians from that city in recent decades. As the papal visit nears, the talk in the media – and statements from the Catholic Church – are about Jewish graffiti, not Bethlehem's Christian tragedy. Papal Nuncio Archbishop Giuseppe Lazzarotto played down on Sunday media concerns the visit could be spoiled by Jewish extremists, saying the numbers of those involved in nationalistic vandalism was "very limited." 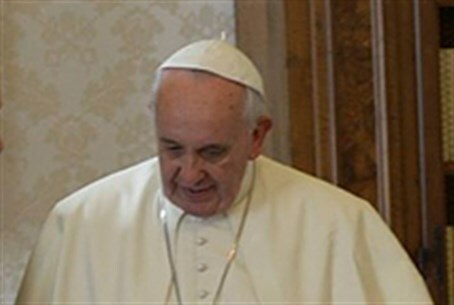 "We know that this happens but we should not over-estimate them, or give them more importance than they have, because we know that the majority of the Israeli people are happy that the Holy Father is coming," he told reporters. He said Pope Francis was coming to bring a powerful message about coexistence without fear. The pope will begin his trip in Jordan on May 24, travelling to the city of Bethlehem the next morning. Later that day, he travels to Jerusalem where he will stay until the evening of May 26. Christian Arab residents of the village of El-Khader in the Bethlehem area were savagely attacked by local Muslims as they celebrated a Christian holiday two weeks ago. A report by CAMERA, an organization which monitors anti-Israel bias in the media, reported that Christians attempting to enter Saint George’s Monastery in the village were intimidated and attacked with rocks and stones. Ever since the Oslo Accords handed over control of large parts of Judea and Samaria to the Muslim Palestinian Authority, Christians in Bethlehem have been suffering persecution and their population has drastically dwindled. Justus Reid Weiner of Hebrew University has reported that Bethlehem's Christians have been suffering "many examples of intimidation, beatings, land theft, firebombing of churches and other Christian institutions, denial of employment, economic boycotts, torture, kidnapping, forced marriage, sexual harassment, and extortion." PA officials are reportedly directly responsible for many of the attacks, and some Muslims who have converted to Christianity have been murdered. The Muslim Fatah-controlled authority in Judea and Samaria is encouraging a "sharp demographic shift" in Bethlehem, where the Christian population went from a 60 percent majority in 1990 to a 40 percent minority in 2000, to about 15 percent of the city's total population today, according to Weiner.